The Abdominal Snowman are often found alone in the northern tundra reaches. They will normally be guarding small caves, filled with the treasure of their victims. 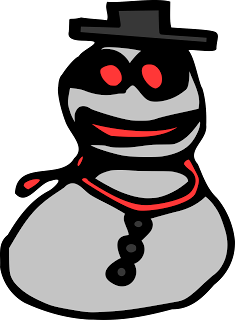 In a fight the snowman will hurl large ice filled snowballs causing 1d6 damage each. If standing within 15 feet of the snowman, they can cause the ground to become extremely icy, thus reducing anyone’s dexterity to 5. This effect lasts for 4 turns.